Explaining his unconventional entry into the world of interiors, Neale Whitaker – Australia’s Vogue Living editor – reveals, “I sometimes feel as if I arrived here by accident!” Accident or not, I’m certainly glad he’s here having tracked his career from editor of Belle to his current position as head of the Condé Nast juggernaut. Discover Neale’s world from the busyness of editing one of the world’s most respected interiors magazines to who would be on his fantasy dinner list (we completely agree! ), stopping off at his inspirations, style and design mantra along the way. How did you first get into the world of interior design? I sometimes feel as if I arrived here by accident! I’m a magazine editor by profession and in 2006 I took over the reins at an Australian interior design magazine called Belle. I remained in that role for 8 years and, in 2010, I also joined a TV reality renovation show called The Block (as one of three judges) which is a ratings juggernaut for the Nine Network in Australia. I’ve now made nine series. I joined Vogue Living as Editor-in-chief in December 2014. What’s a normal day like at Vogue Living? No such thing! Like most bi-monthly magazines we are a very small team and we all wear many different hats. Much of my day is spent behind my desk at our offices in Sydney (Vogue Living is published by NewsLifeMedia under licence from Conde Nast International) but I’m also out and about at many industry and client-related events. Editing a magazine in 2015 is very much about being the face of a brand and ensuring the brand is well represented. I’m trying to avoid using the word eclectic as it’s so cliched, but I guess that’s what it is. It’s a mix of many different styles and eras but it all seems to come together. I’m definitely not a modernist although I enjoy some contemporary pieces. Art is very important to my partner and me. Your design mantra is “go with your gut, your heart and your soul” – how does that affect design? Remember I’m not a designer, but I believe a home should tell the story of the life lived there. To me the most interesting and inspiring homes are ones that have evolved over time. I’m not a great believer in trends either – in your home you should only ever have things you love, regardless of whether they’re fashionable or not. Which design movement is, to you, the most timeless? That’s a tough question to answer. In terms of its ability to work seamlessly with so many other styles and aesthetics, the mid-century movement is probably the most enduring. Mid-century is usually defined in terms of Scandinavian and American design but it feels as if there is a growing interest in mid-twentieth century Italian and French design too. Whose work are you most inspired by at the moment? I’m finding the work of some of the Italian design studios really interesting – Studiopepe and Dimore Studio spring to mind. Studio KO in Paris is producing some beautifully refined work. Nicemakers in Amsterdam are a recent discovery and I really like what I’ve seen. Neri & Hu from Shanghai are interesting, particularly in the commercial sector, as are Commune from the US. And while they’re not interior designers as such, I’m intrigued by the influence that Dutch design duo Scholten & Baijings have had on contemporary design in terms of colour and aesthetic. I also love the work of Kate Hume and Katty Schiebeck whose star seems to be rising in Barcelona. Australian interior designers are very good at observing global trends and distilling and adapting them for our climate and lifestyle. There’s a freedom of thought and an independent spirit that I believe have really come of age. Interior designers like Hecker Guthrie, BKH, David Hicks, Greg Natale, Blainey North, Arent & Pyke, Kerry Phelan, Fiona Lynch, Meryl Hare and Christian Lyon are producing work that is truly world-class. From the world of design, who would be on your fantasy dinner party guest list? My favourite dinner parties are those where everyone brings something different to the table – so a table of designers might be a potential nightmare! But I’d very much like to share a glass of wine or three with Terence Conran, Kelly Wearstler, Jean-Louis Deniot, Kate Hume, Kelly Hoppen, Christian Liaigre, Axel Vervoordt and Martyn Lawrence Bullard. That would be quite a party! I would have loved to meet the late David Hicks. Which trend have you embraced this year and which have you avoided? I really try to avoid trends but I must admit I love that rattan-backed furniture is suddenly very fashionable again. It’s one of my favourite styles and I’m enjoying seeing colonial and ethnic influences woven into very contemporary interiors. What are your plans for Vogue Living for 2016? To continue to grow and develop the magazine in terms of print, online and digital. 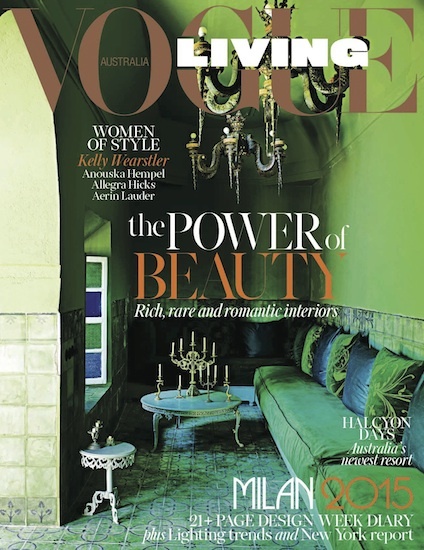 Vogue Living is a global brand and the potential is limitless!